Hey guys! Since this blog was mainly used for our lives in Europe, we decided to have a new http address with a more family feel, instead of the town we lived in in Belgium. The old posts are all transferred, all we need is YOU! 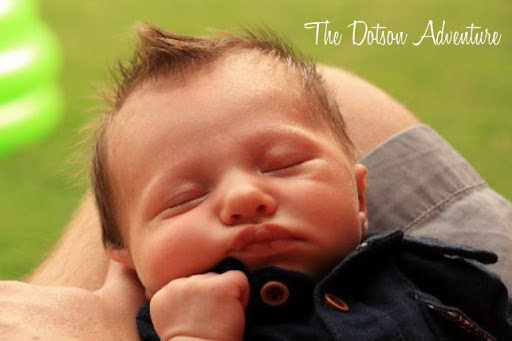 So, head on over to www.thedotsonfam.blogspot.com and see the new look. And...PLEASE CHANGE the old address in your blogroll with our NEW ADDRESS! See you guys over at our new home! Knox is happiest in the mornings. Stephen and I love the huge smiles and happy demeanor...we could just eat him up! Hopefully you could ignore the sunlight coming in and tune out my obnoxious mommy voice! This past week Knox and I had fun visitors from out of town...both named Sarah! Sarah C. flew in from Belgium to visit, and Sarah F. and Dean from Houston. We loved getting to see both ladies, and sweet Dean and Knox loved chillin'. At least we think so. We decided to hit up the Dallas World Aquarium with the kiddos. It was awesome. Knox slept the entire time, but Dean was in awe of all the new creatures and big fish. The adults enjoyed the sites, too. Too bad we forgot the cameras...iPhone pics will have to do! Myself, Knox, Dean and Sarah F.
The next afternoon, Sarah C., Knox and I headed out to Southfork Ranch to catch the tour of "Dallas." Sarah had watched the series' re-runs as a kid in Scotland, so she was quite nostalgic. It was before my time here in the states, but our tour guide brought it to life for us...and insisted we take pictures all over the house. I again forgot my camera (won't make it a habit, no worries), so these are "non-iPhone user" quality, i.e. blurry. Stephen and I took some pics for Sarah C. to have when she goes back across the pond, so I thought I'd share. His shirt says, "Kind of a big deal." Obviously! Cooler than it typically is at this time of year, we were able to get out and enjoy the neighborhood 4th of July parade. Knox and the girls loved it!! We had the priviledge of taking Knox down to see his Great-Great-Aunt Arjorie last night. He loved getting to meet her, and I think it's safe to say the feeling was mutual!! Arjorie is a grandmother to me, so it was very special sharing our little man with her. I love her dearly, and it means a lot to have these pictures!! 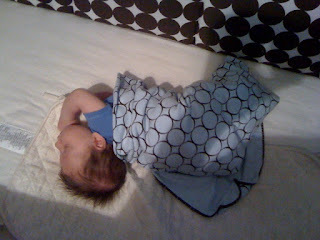 I said earlier that I would be taking his monthly pictures in the moses basket...that was until we went to Wisteria.. They will now be taken in this little gem :) And just for my records, he's 9-weeks in these! Knox is two months old. Big boy :) We went to the doctor today and he passed with flying colors. The shots were a breeze for Mr. Knox. He cried for a few seconds and was over it by the time daddy picked him up. His mom on the other hand...not so much. So sad seeing them hurt! We're so thankful for a healthy baby. Now we just need to focus on bubble wrapping the house and all will be good! Those cheeks are starting to fill out! 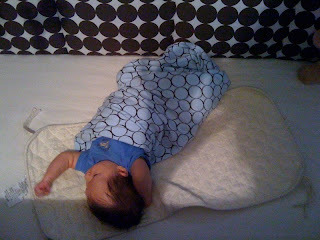 He's doing better at laying alone and playing on his activity mat or just looking at the ceiling fan (his favorite). He loves to make eye contact with us and smile and coo...adorable! Just happy and content! We love him so much!! Knox has always been a mover and a shaker. I remember the doctor asking me about his kick count...ha! He moved NON-STOP in the belly, and not much has changed. 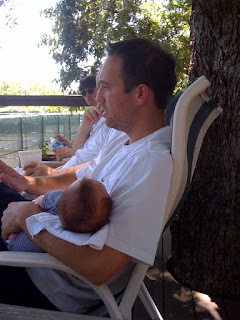 Stephen had his first Father's Day, and I'm pretty sure it was spent the way he wanted it to be...sleeping in, tennis match and pork chops. We were able to sleep in because Knox slept from 10pm-8am STRAIGHT. Can I get an amen? It was much needed, and well received. Glorious. I can now say, though, that it was a fluke! Stephen plays tennis in a league and has matches every Sunday. This Sunday, however, the opponent forfeited (Stephen's a big deal, I would have forfeited, too!) so he just hung out with the guys and had a beer. Knox loved it! That evening Kelly came over and we grilled pork chops and had a nice little family dinner. We were in bed by 10. It was awesome. Thanks, Stephen, for being the dad and husband I knew you would be! We love you! Isn't she the cutest thing you've ever seen? Knox was impressed!! He's trying to play it cool with the nonchalant yawn. She's not fooled, she's got him in the palm of her hand! She likes him, and his faux-hawk. Knox wasn't embarrassed his parents were on their first date, mainly because hers were, too! We had a great time catching up, and can't wait until the kiddos can play again! He's started smiling and cooing. It makes my heart smile. I just love him. My sister and her husband came into town this past weekend for a wedding, and I caught this cute picture of Knox with his Uncle Matt. There were cute moments with Hayley and Knox, but of course I didn't have my camera. Next time skeeter!! They finally made it official and it was beautiful, much like the bride. Aunt Kelly watched Knox for the first half of the night so we could see the ceremony and eat without disruption, and then he joined us for the dancing. He had a great time!! Us with the beautiful couple. She looked stunning, and Karim was glowing in her presence! Our cute family of three!